A great day on Wall Street … and we don’t mean the stock market! Home » A great day on Wall Street … and we don’t mean the stock market! 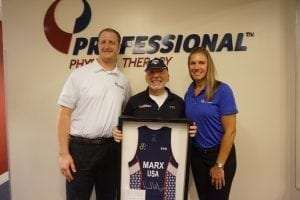 Edward Marx, Duathlon World Champion and member of Team USA, honored our Wall Street clinic by presenting our staff with a signed Team USA jersey! This was in appreciation for the excellent care and encouragement he received during his physical therapy rehab from a torn meniscus. Feeling pain in his left knee while training for a sub-90 minute half marathon, Edward sought medical care at the Hospital for Special Surgery (HSS) with Dr. Frank Cordasco. Post-surgery, Professional Physical Therapy was recommended as the premier organization for his recovery treatment. Just seven months post-op, with the encouragement of his physical therapist, Jaime Quinn, he entered the 2017 Team USA National Duathlon (long course) Championships in Cary, NC. 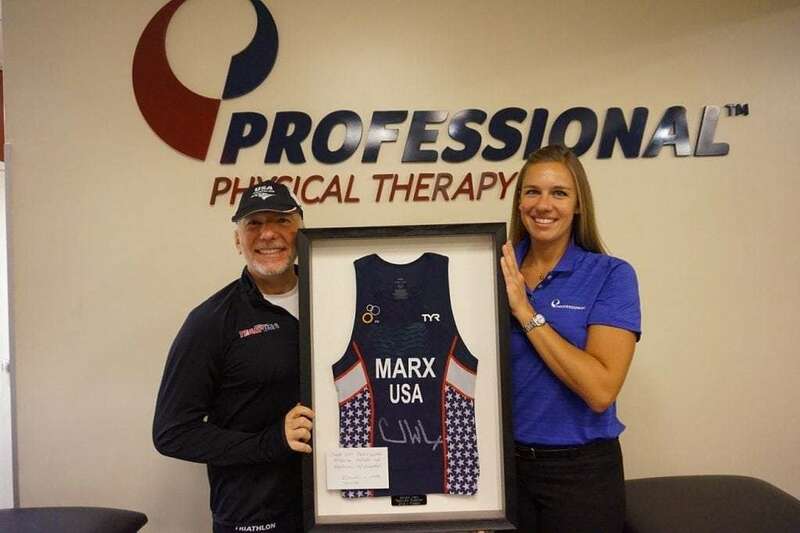 Once his physical therapy program was completed, Edward continued working with Professional’s athletic trainer, John Gary, to enhance his performance through their Bridge Program. The Bridge Program “bridges the gap” from the time patients are discharged from physical therapy until they are cleared to resume sporting activities. The program is customized to the specific injury and sport and enables patients to take their rehabilitation to the next level –to increase strength, endurance, power and agility. His hard work paid off, and Edward became one of the first athletes to make all three of the Team USA Duathlon squads! Thanks to Jaime Quinn, DPT, Partner and Area Manager, NYC and John Gary, Athletic Trainer, and his obsession to push himself to the limit, Edward is on his way again for Team USA for 2018! Check out what Edward had to say here.